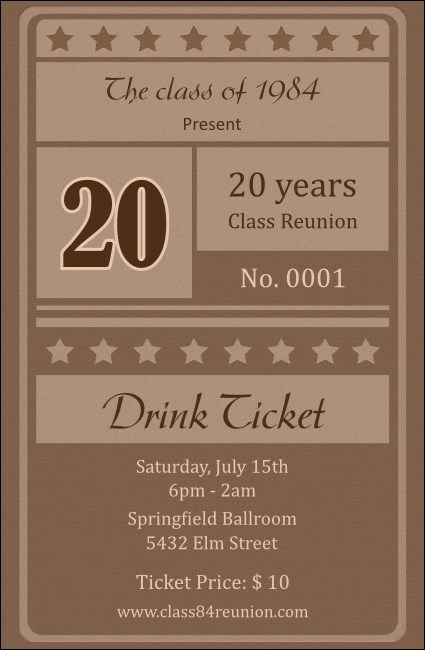 Alumni will appreciate the snazzy look of the Reunion 2 Drink Ticket, and your event budget will, too! This easy-to-customize design prints on quality card stock while remaining affordable. Plus, it helps to create a happy medium between open and cash bars. Use it to offer a complimentary drink or two! Size at 2.71" x 4.14"
Throw a great event with an organized bar! Find the right drink tickets on TicketPrinting.com.